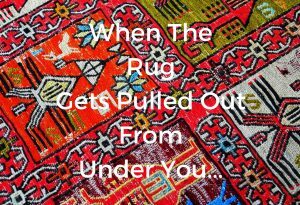 We recorded this video “When The Rug Gets Pulled Out From Under You” with a story from our past and our most recent “curve ball” We hope you will take value from it and it helps you to march on and keep your dreams and goals alive. That’s why we want to share this F.REE summit with you that our good friend Russel is putting on. Each of his 30 speakers are going to answer that question above. They will lay out their step by step detailed ACTION PLAN (Day 1 through Day 30) on how they’d get their business up and rolling…and each plan is DESIGNED to start out from ZERO. Even if you’re starting out truly from “Square ONE“… this summit is pre-engineered for YOU to succeed starting from SCRATCH! This entry was posted in Affiliate Marketing, Business Success, Entrepreneurship, motivation and inspiration, Retirement and tagged Chris and Susan Beesley, Chris and Susan Beesley When The Rug Gets Pulled Out From Under You, Click Funnels Free Summit, Click Funnels Training, Free Summit, Mindset Shift, When The Rug Gets Pulled Out From Under You. Bookmark the permalink.